The user’s question: The option “Don't use CPU threads when possible” is enabled in the settings of AccentZPR. Standard brute force attack is applied but still CPU is used to the 100%. Only GPU is supposed to be working, right? What am I doing wrong? How do I reduce CPU usage? First of all, and that’s important, in the case of classic zip encryption GPU-powered processing is only possible when standard brute force is used, that is when the program is trying passwords one by one without any preset conditions. In all other cases the processing load is borne by the CPU, with no graphics cards involved. That means if you’re using an attack other than direct enumeration or the last character in the mask is hidden, then you won’t be able to reduce CPU load because in this case the password cracking is done exclusively on CPU – without GPU acceleration. This is due to the specifics of the Zip file format and the algorithms used in password recovery of Zip files. The load on CPU is directly proportional to the productivity of GPU as well as the number of GPUs involved in password hacking and the size of a zip file. In simple cases, for each GPU in the system, one (logical) CPU thread will always be loaded 100%. Most often, there will be two such threads while high-performance video cards with a high computational speed can load the entire processor even if the option “Don't use CPU threads when possible” is enabled. In short, if you crack zip archives with classic encryption you cannot do without using CPU. 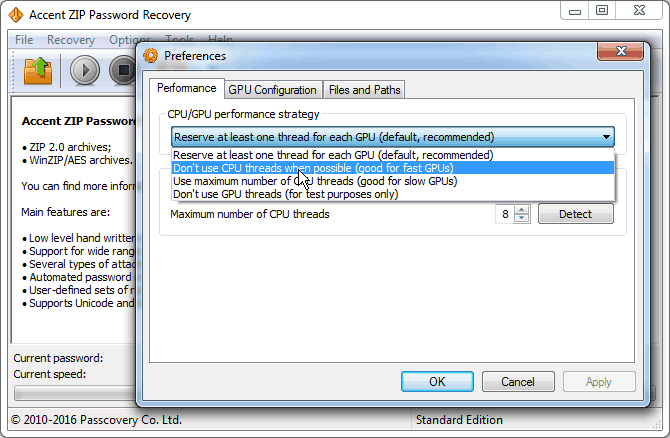 Therefore, we recommend using AccentZPR settings, which are set by default – “Reserve at least one thread for each GPU”. This will allow the program to optimally use your system resources to ensure Zip password cracking at the maximum possible speed. 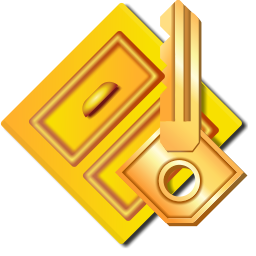 The trial version of Accent ZIP Password Recovery for two editions of Windows is available at the Passcovery website. It is free of charge, digitally signed and guaranteed to be free from viruses and malicious code. Try a truly effective solution for cracking Zip passwords right now! Related articles My password is 8-10 characters long. It starts with a capital letter and ends with a number. How do I set these conditions to crack the password using your software? My system is overheating. If I set the thread count to 0, does this mean it is not using any CPU and only using the GPU?